Did you know pets actually have a carbon “pawprint”? Pets are great companions and additions to families. In fact, studies have shown that pets help increase happiness, reduce stress, and encourage a healthier lifestyle. On the other hand, many pet parents don’t realize that pets can have a significant impact on the environment. This year, in honor of Earth Day, go green and celebrate with your pet! Pet shelters and rescues are filled with pets just waiting for their forever home, and there are countless homeless pets roaming the streets. Spaying or neutering your pet can help decrease the population of dogs and cats that don’t have homes by preventing unplanned litters. Speaking of pets that need a home, consider adopting a pet from a shelter or rescue. By doing so, you’re saving 2 lives: the life of your pet and the open spot in the shelter that allows another pet to be brought in. If you feed your pet wet food, it likely comes in a can. The best thing you can do is to recycle the can from your pet’s canned food. A more ecological option for feeding your pet canned food is to buy the biggest can of food so less metal is used by splitting the meals from the larger cans. Also, buying in bulk will not only save your wallet, it will minimize packaging. Shelters and rescues are always in need of supplies. Donate your pet’s gently used supplies like old towels, blankets, leashes, beds and toys. Accidents happen and baths are inevitable. Switch over to environmentally friendly cleaners and shampoos. Not only are they better for the environment, but they generally contain ingredients that are less toxic to your pets. Plus, green products usually come in packaging that is recyclable or biodegradable. This cannot be stressed enough. One of the best things pet parents can do to help the environment is pick up their pet’s waste and dispose of it properly. 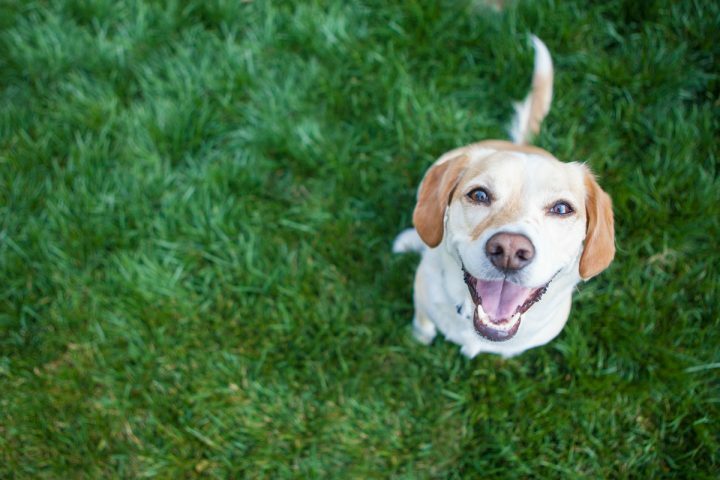 Both bacteria and intestinal parasites can be passed along in poop, which can harm the environment and even other pets that come into contact with it. Also, no one wants to step in dog poop when walking outside. Cleaning up after your pet reduces the chances of spreading parasites and disease as well as keeps your community clean. You can go green with your cat’s waste too! Doggy poop bags aren’t just for dogs; you can use the bags to place your cat’s poop and clumped litter into! Try transitioning your cat to a biodegradable litter for a more eco-friendly option. Poopy Packs are convenient, stylish, and best of all, degradable! Poopy Packs are pet waste bags that are strong, leak-proof, environmentally-friendly, and stylish. Each uniquely designed bag is 100% degradable, so there’s no need to worry about the effects on the environment. These stylish waste bags fit in all standard-size dispensers and are perfect for walks, trips to the dog park, while traveling, or any other activity you and your dog do together. Poopy Packs come in a package of 8 rolls. Each roll contains 20 bags that can be easily separated using the perforated edges. Win FREE Poopy Packs for your pet! Run out of poop bags? Just leave a comment below, and you could win FREE Poopy Packs for your pet from 1800PetMeds! Ten winners will be chosen at random Tuesday, April 16, 2019, so everyone who participates has a chance to win! There will be a total of three (3) winners. (Limited to residents of the U.S.) Good luck! Have you seen our new commercial? Check it out! ← Most cats love cheese, but is it a healthy treat? Green is clean! Thank you for being eco-friendly! 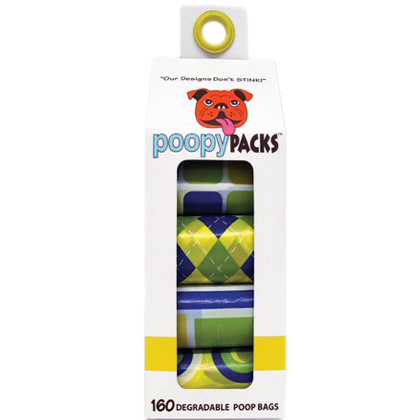 The Poopy Packs are perfect for my dog when we go hiking or walking. Poopy Packs are so much better than using a plastic grocery bag which sometimes leaks and has holes in it. Poopy Packs are strong and leak-proof. I love that these are eco friendly! Can not believe how many of these we go through! I always said to my daughter when she was little -“ If you love your dog you will clean up after them”. She always finished by saying “yeah it’s not the dogs fault they don’t have thumbs – so they can’t clean up after themselves” that always made me laugh, we always carry extra poop bags! Poopy Packs are a real necessity when you have 5 Basset Hounds and a foster or 2. I preach the pick up and practice it too. I would love to try these! Hope I win! I use Walmart ones and would love to try these. Never knew that dogs could leave a big dump till we got our pitbull. Love these bags. We have four dogs and would love to try these bags out. Oh…I would love to try these! Happy to go green and be clean. Running low on poo bags!! Our pitty is a 3 a Day pooper. Would love to feel better about throwing away his poop bags. My dog poops a lot! Use the poopy bags so we don’t have to use the poopy bags for someone else’s poopy!!!! Going green is clean! Love to try! I have two dogs and we love to go for walks every day! With two large dogs that walk a neighborhood daily, we use a lot of poop bags! Biodegradable bags are just what I have been looking for!